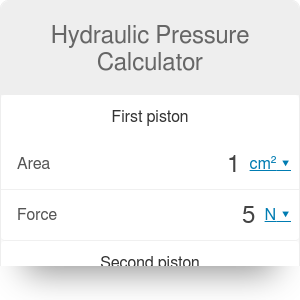 This hydraulic pressure calculator analyzes a hydraulic system of two pistons connected to each other via a medium, usually a liquid. Such devices are usually used in situations where you have to lift something heavy using a lower force, e.g., automobile hydraulic lift in service stations. You can find mechanical analogy of hydraulic press in our mechanical advantage calculator, where we have described six simple machines such as a lever, a pulley or a wedge. The basic principle of the hydraulic press is based on the so-called Pascal's law (also Pascal's principle). Read on if you want to learn what is Pascal's principle and how to use it to estimate appropriate areas of the pistons and the forces exerted on them. In the following text, we have also provided an example of hydraulics calculations which can be done with our Pascal's law calculator. The Pascal's law says that if you apply external pressure on the liquid of gas in the enclosed container, the pressure will be transmitted throughout the fluid so that the same shift occurs everywhere. This law was named after Blaise Pascal who in 1646 performed an experiment called Pascal's barrel. He inserted a long vertical tube into a barrel filled with water. Then he poured the water into this tube, which increased the hydrostatic pressure. At some point, the pressure inside the barrel was too high and the barrel burst. 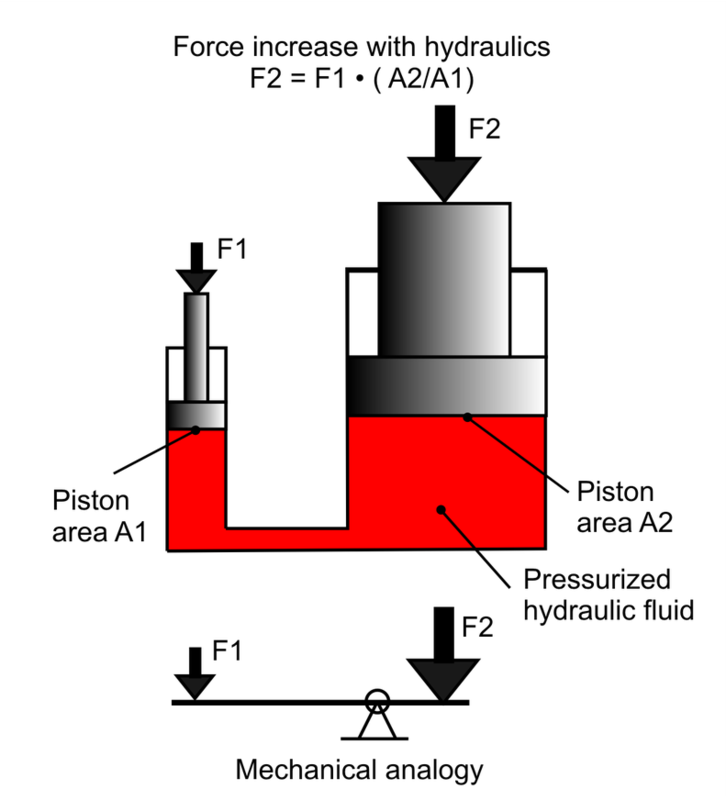 Pascal's principle is used in many hydraulic systems, such as hydraulic press, which is shown in the figure below. There are two pistons: one with a smaller area and one with a bigger area that are connected with each other via some hydraulic fluid. The pressure that the smaller piston exerts against the liquid will be precisely equal to the pressure the liquid exerts against the bigger cylinder. It is important to stress that not the forces, but pressures are equal. A₂ is the area of the second piston. d₂ is the distance at which the second piston has moved. In the advanced mode of our hydraulic pressure calculator, you can also estimate parameters: d₁, d₂ and W.
Pressure is usually exerted on fluid in the small piston by a compressor. If you assume that the small piston is a circle with a diameter of 3 cm then you easily compute that its area equals A₁ = 7.069 cm² (you can use our circle calculator to compute the area of the circle). Similarly, if the bigger piston, which lifts the car, is a circle with 30 cm in diameter then its area equals A₂ = 706.9 cm². The weight of car with mass of 1000 kg is F₂ = 1000 kg * 9.80665 m / s² = 98066.5 N, because Earth's acceleration is g = 9.80665 m / s². Finally, with our Pascal's law calculator we can calculate that to lift a car with a mass of 1000 kg we need only F₁ = 980.7 N which corresponds to the mass 100 kg, approximately a mass of human body! At the same time, the liquid pressure is p = 1387.3 kPa which is 13.69 times higher than the atmospheric pressure. Check out pressure conversion calculator to learn how you can switch between different pressure units. In the advanced mode of the hydraulic pressure calculator, you can also estimate how far a smaller piston should be pushed to lift the car, for example, at 10 cm. After simple calculations, the answer is 10 m, which is relatively long. Hydraulic Pressure Calculator can be embedded on your website to enrich the content you wrote and make it easier for your visitors to understand your message.